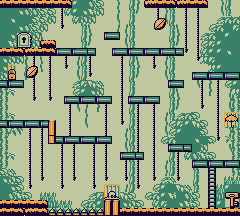 Stage 4-10 is the tenth level of the Jungle in the Game Boy of Donkey Kong. The level introduces Jumpers, friendly Frogs that help Mario get up to higher platforms. Mario starts off near the bottom of the level. He must Jump up to the first two Vines while avoiding the Snapjaw above the first two vines and jump over to the next vines (as the vines are too far to reach) across to right over the Spikes, then once he's got across he will see a Jumper who will help him by doing high jumps. Mario must go over to the Key pass the Jumper and grab it, then he must throw the key up then climb the Ladder or get the help of the Jumper to get up to the platform. Once up there he must do some jumps over some gaps until he gets to the point where he must jump up onto a small wall to get up to the platform where the first Snapjaw was but he can defeat it with the key or the Fruit above it. Then he must take the key and throw it up the the next platform then quickly climb the vines up to the platform to get the key back then continue on, there's also a Snapjaw above the platform he threw the key to so he must avoid it while getting the key back. Mario can then encounter another Jumper which can quickly lead him to the top without having to do the platforming but he chooses not to he must make some jumps onto some platforms then throw the key up to the platform with a Snapjaw and which could defeat it if it's close enough, if not Mario must climb up the vines then get the key back then throw it at the Snapjaw or use the Fruit above it to defeat it. Then Mario must grab and take the key and continue left until he reaches a platform slightly above the one he's on that he must jump on then jump off to the left while throwing the key to take out the Snapjaw, then he must simply take the key to the door to end the level. Hat: On a platform just after Mario crosses the Spikes. Parasol: To the right of a Vine. Bag: Next to a Fruit. This page was last edited on December 31, 2017, at 21:20.